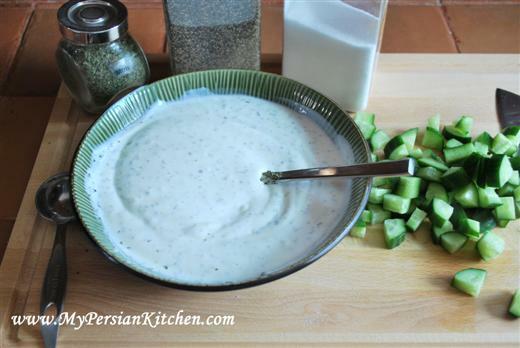 Mast-o-khiar is such an easy and quick dip to make. Literally translated the name of this dip means yogurt and cucumber. It is one of the staples at Persian parties because it is such a crowd pleaser. I am told, by fellow Persians who love to drink Vodka on the rocks that Mast-o-khiar and said drink are very complementary to each other. Personally, I am a vodka with a dash of cranberry juice and lemon rind type of girl! Some people get fancy with this dip and add a few types of herbs while others also add garlic or chives. I like to make a simple version that is milder in flavor since it doesn’t have any garlic or chives. All you need are the above ingredients. 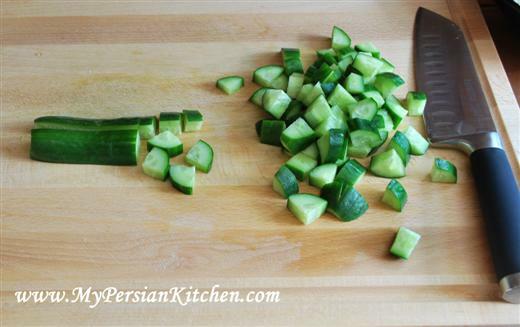 Cut cucumbers in half, then cut in half again and slice in 1/4 inch pieces. 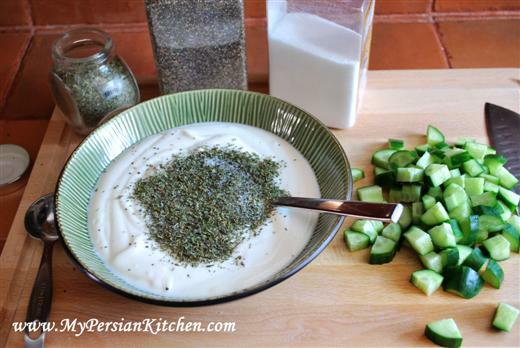 Add 1 tablespoon of dried mint, sat, and pepper to yogurt. Add cucumber and mix. That’s all! Simple and quick! You can also garnish the top with fresh mint or dried mint. Or both! I’ve been following your blog for some time and I’m delighted that you put this recipe up for Mast-o-Khiar! We love it. On everything. Especially Eggplant Khoresht. I was introduced to Persian cooking by a friend of mine who married a lovely gentleman from Iran. Oh the meals! Since then, I’ve tried my hand at a few of the recipes in the New Food of Life recipe book, but I love how you demonstrate on your blog how to do many of the recipes. We just celebrated the Passover with a whole crowd of people and had a professional caterer provide a full Persian Buffet. It’s always a hit and a special treat. I just wanted to finally write in and tell you that your recipes, pictures and instructions are wonderful. You have a faithful reader! i love Mast- o- Khiar. i usually add a pinch of garlic powder ,raisin, crushed walnut and red rose ( gole Sorkh) powder to garnish. this dish is the best, good with everything. @ Maryam, I add all the ingredients that you listed when I make mast-o-khiar soup. So good! @ Maya, thank you for your kind words! I am so glad there are so many people who enjoy this website! What kind of mast do you buy? I have a hard time finding a yogurt brand in the grocery store that combines well with the mint and tastes right? One thing I love to do with mast-o-khiar is order it as a side at a kabob restaurant and dump it on my rice. (Note: I would never do such a thing to rice made by my mother. Home cooked chelow polow is too good for that). Beautifully photographed, clearly explained. Your presentation is much better than mine! @ Tanya, I usually buy my yogurt from Persian store as I like the taste much better than yogurt purchased from regular grocery stores. 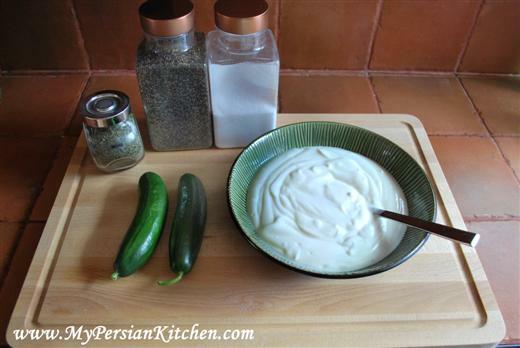 I find that not Persian yogurts tend to be on the watery side whereas Persian yogurt is generally firm. @ Sam, thank you for your kind words. Keep posting about Persian food! My mother always grated the cucumbers instead of chopping them up. When I try to make it – I never can get it to taste quite right – or how it tastes in a Persian restaurant. I don’t have any Persian markets near where I live – do you think Greek yogurt would work out well? Yasi, I have seen people grate the cucumber but personally I prefer not to because it makes the cucumbers too watery. I suppose you could squeeze them…I would definitely use Greek yogurt. I think it would actually be pretty good. Love how you garnish it! I tried this a while back and it tasted delicious. I keep repeating myself when I say I love the photo’s, there are other blogs who also post recipes but this is where yours is unique. It is great to see what it should look like step by step (not just the yogurt) and for me this is amazing. Alexis, thank you for your sweet words. It’s always nice to hear that the hard work pays off! chips, pecans coconut,almonds, I don’t know what it was called ? Would you have any idea? Stacy, I have never heard of the dessert that you are talking about it. It is most probably something that the person who made it invented herself. But boy does it sound delicious! I’ve had this dish with dill instead of mint. Is that a Greek variation? Also along with your recipe, using the mint, some people add onion, raisin, etc. Just personal preference? I’ve got a boat load of fresh pickling cucumbers in the garden and love this salad! I married a wonderful persian and next to him and my son, persian food is my next love. It is the most delicious cuisine in the world. This mast-o-khiar recipe is simply the best – though, I also love borani. Thank you for this blog cause when I make persian food I follow your steps and I look good. Merci. Venezuelan_Girl, so glad that I can be of help!! Keep cooking!!!!! Oh YUM! My husband took us out for persian food, he loves it. We agree completely. So tasty and healthy!!! Thanks for explaining it to this complete americana! Even the kids love it! Hi! 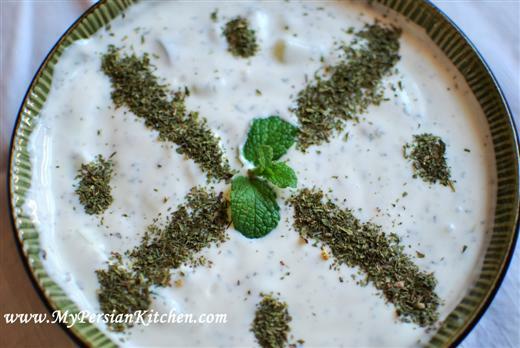 Is this the dip that can be used with the Persian ground beef kebab? Thanks so much! My husband and I LOVE Persian food! CJ, yes, it can be! I love your recipes the only problem im haveing is that my ta dig burns and sticks maybe im over cooking but the rice is perfect. Laurie, thank you. Make sure that you have enough combination of canola oil and water at the bottom of your rice and that after the fist 10 minutes you turn your heat down to low. When I make Persian rice, I don’t use oil, I rather use butter. First I add dill weed and sea salt in the water, potatoes and safran at the end. 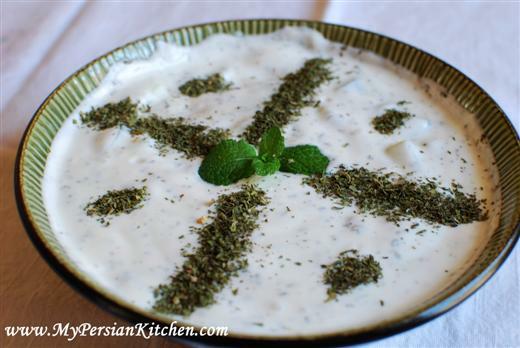 It’s quite an original recipe and once uve tasted Persian rice made this way, you’ll never want it another way again ! First I boil safran with butter in a differnt small sauce pan at a very slow simmer, constantly stirring it to add it at the end. When making the rice, I cook it half way, drain it, put it in another bowl while I rub butter around the pot in order to ad Thinly sliced potatoes to the bottom and sides of the pot before putting the half cooked rice back in. Then I lower the heat and ad the boiled Safran by making a donut shaped hole in the middle of the rice and pouring the safran into the rice hole. I cover the rice with paper towels and a lid and when the rice is done, it has a beautiful orange color in the middle and the potatoes are crispy and full of flavor. 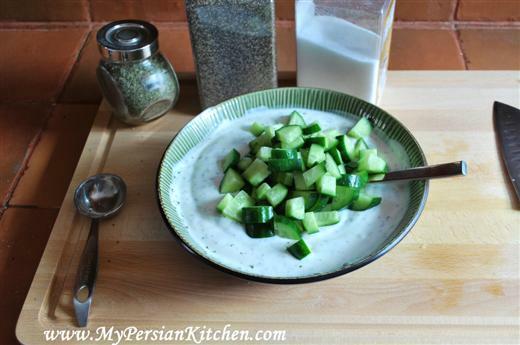 This goes wonderful with yogurt cucumber sauce and any dish. I hope u enjoy this recipe! Hi there! We are invited to a Persian dinner party on Friday night and I’m assigned to bring an appetizer. I thought I’d bring this dish along with your feta stuffed dates. Can you tell me what you dip in this yogurt dish? Would I use a pita bread? Sorry for my ignorance and thank you for your recipes and help. Robyn, you can dip chips, or vegetables. But it is mostly really eaten as a side dish with rice. Cindy, personally, I would not freeze it.